Sports Direct earned themselves a brand new customer... but will he ever walk again? For the past few years my 17 year old son has been playing football with a bunch of lads on a municipal pitch every Saturday morning. At some point along the way, I mentioned that I might ‘get the boots down from the loft’ and come and join in. To be fair, he didn’t even attempt to call my bluff – even he knew the consequences of a man in his fifties trying to recapture the form and fitness he had 35 years ago, and how stupid it would be to actually go through with it. But I will never learn. So, on Saturday morning I found myself in Sports Direct asking a wary young sales assistant questions like ‘Is this the weather for soft ground or hard ground studs?’, and ‘Tell me about your range of shin pads’… I bet he thought it was the worst Mystery Shop in the history of sports retailing. Anyway, in about 6 minutes flat he sold me the boots, shorts, socks, shin pads – and a ball I’ll never need. He actually patted me on the back as he led me to the till to pay - like the male nurse did just before my vasectomy. I arrived at the field of dreams, and my son’s face was a picture. It was a mix of astonishment that I’d actually shown up, and the dawning realisation that I would soon be let loose to make a total fool out of both of us. This was heightened by the fact that there was another father/son pair who were both whippet-fit, and highly skilled players. The stakes were suddenly massive. 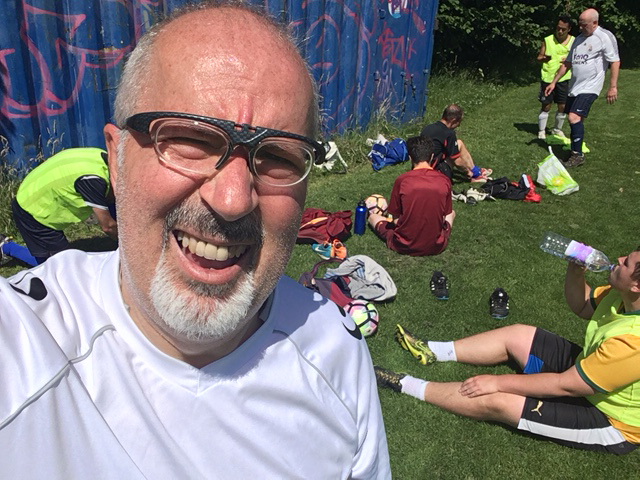 We played for almost 2 hours during which I did actually recover some of my former skills - including some Le-Tissier-like passes that surprised everyone, including me. But it all came at a cost – notably my ability to walk for the rest of the weekend. Waking up on Sunday morning I tried to get out of bed. It wasn’t a problem – it just took me 45 minutes. Another half hour to get down the stairs and it was just like any other day. Of course, it’s true. Having said that, I enjoyed it all so much I’ll probably be out there next Saturday morning if I can hobble down to the pitch.